For Kiko, a biracial Nebraska teen, attending Prism, a prestigious art school, will allow her to pursue her dream of making art and to escape a toxic family environment; denied admission, she has no Plan B.
Kiko’s Japanese-American father and his new wife, a white woman, like Kiko’s mom, are preoccupied parents of twin baby girls. Kiko and her two brothers live with their self-absorbed mother, who belittles all things Japanese, raising Kiko to consider herself unworthy and her Japanese features ugly, to the point where she and her brothers used to compete over who looked least Asian. Knowing her brother abused Kiko as a small child, her mother not only allows Uncle Max to move in, she prohibits Kiko from putting a lock on her door. Kiko knows she must leave, but her traumatic upbringing has left her with crippling social anxiety, and her only close friend has left for college. A chance meeting with Jamie, the white boy who was her childhood crush, rekindles their friendship, and he invites Kiko to stay with his family in California while checking out art schools. There, mentored by a Japanese-American artist and befriended by his family, Kiko blossoms. 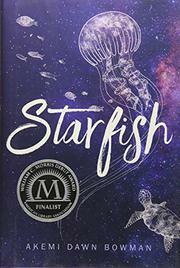 Readers will wonder why Kiko’s mother is more monster than human; why insecure Kiko was certain she’d be accepted to the country’s most prestigious art school (and how she’d afford it); and why the cover depicts a jellyfish rather than the titular starfish.